Available as low as $0.99 per oz over spot! This 1 oz bar has been produced by the Sunshine Mint and is available to investors in brand new condition. Each bar contains a full troy ounce of pure .999 fine silver and has been minted in Idaho, USA. Featuring the mint’s most popular design; the Silver Eagle, these bars are not only made from the purest silver possible but are also visually appealing. The Silver Eagle design found on this bar has become a hallmark of sorts for Sunshine and is widely recognized in the precious metals industry today. Minted by Sunshine Minting in Idaho. Is IRA-eligible and can be included in precious metals IRA accounts. Features unique security technology, including the MintMark SI mark that can only be seen using a special decoder. Please note that Sunshine Decoder lenses are available separately and not included with this product. On the front of the bar, you will notice Sunshine’s depiction of an Eagle which is flying in front of the sun. The sun’s rays are protruding outwards with the word “Sunshine” above and the word “Minting” located below. The bar’s specifications are listed underneath the circular eagle design which display its silver purity and the weight of the bar. 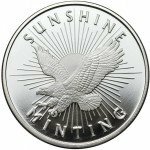 Just like other Sunshine Mint products, the 1 oz Sunshine Silver Eagle bar can also be perfect for IRA investments. With this bullion bar, individuals can begin their retirement account in just 3 easy steps. Of course investors can have the bars shipped to their home or office as well. 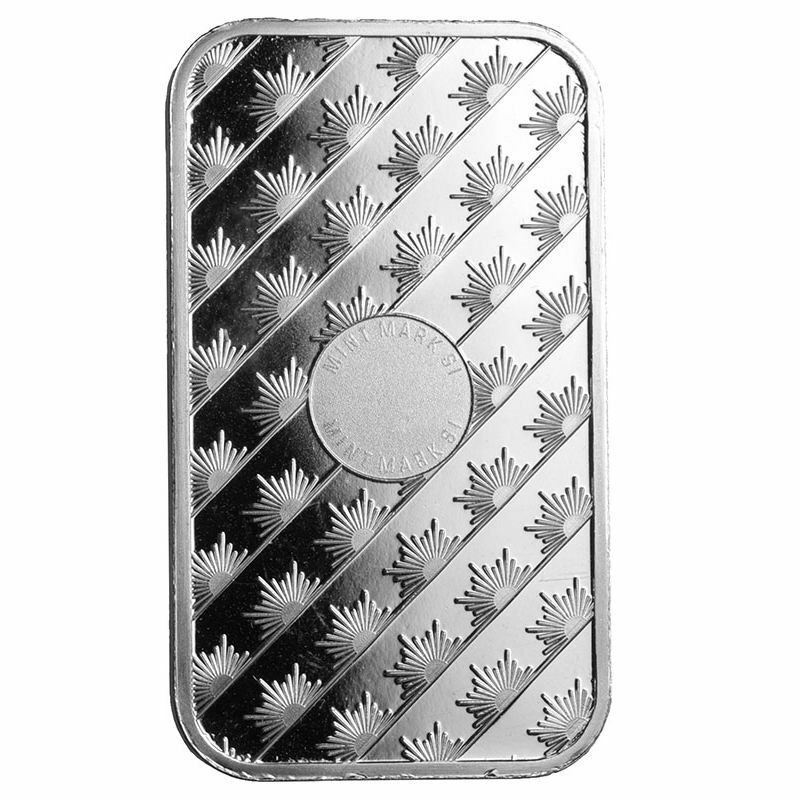 Individuals wanting to purchase a supply of 1 oz Sunshine Silver Bars can do so by contacting us at 888-989-7223. Customers should also note that when purchasing bulk quantities, the bars come in sealed plastic sheets of twenty. For orders with less than twenty bars, they will be cut from their sheet and shipped in their original protective plastic sleeves. These bars come in a variety of other sizes as well such as 5 oz, 10 oz and 100 oz which are also available on our website. I am a first time buyer of precious medals and I was a bit nervous at first, but I must say I am very satisfied with these bars. I plan on buying a few every payday! Decided to diversify my portfolio a bit and add some precious metal to my assets. 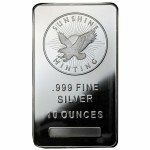 I came across Silver.com and found them to be the cheapest place to find silver. I bought 2 of the one ounce bars, let me just say that they are beautiful. Shipping was extremely fast and was well secured. The overall transaction was fantastic. I am going to buy more and bigger bars to add to my 2 that I now own and will be purchasing them here. Received my order today, was my first purchase with Silver.com. Thank you for the exceptional service!! Well layed out website,lightning fast shipping,and the coins and bars are beautiful!! Hats-off to the staff at Silver.com! Im very happy and will purchase more in the future. 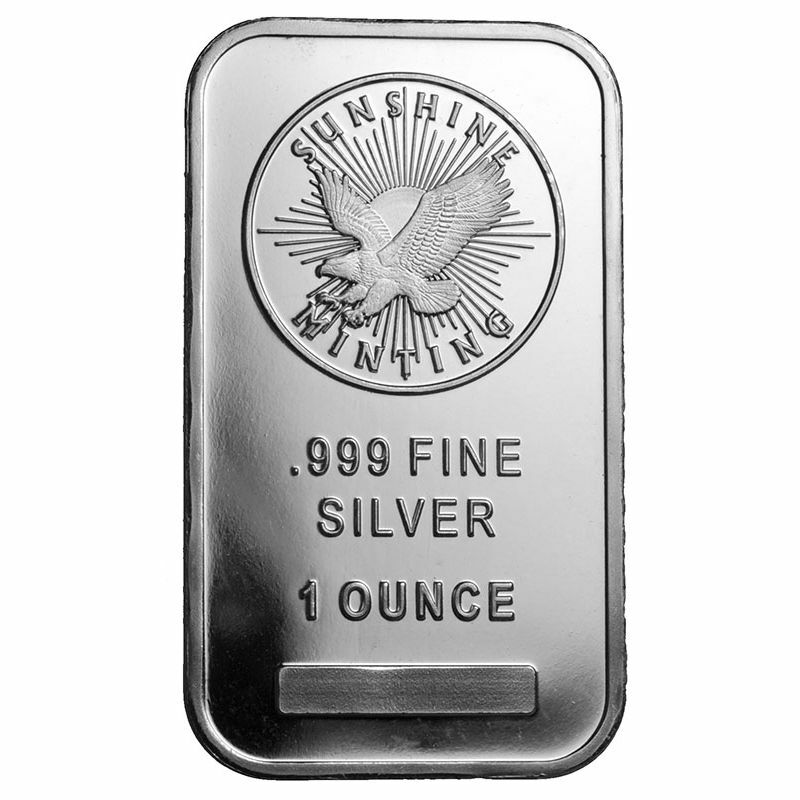 My very first precious metal purchase was this 1 oz silver bar from Sunshine Mint. I’ve bought silver bars from other mints before and Sunshine Mint products have always been my favorite. 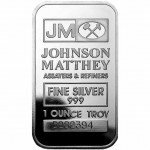 I have purchase this particular 1 oz silver bar several times and in various quantities. I always come back to buy more. WOW – these babies shine like a mirror! Very impressed. I bit the bullet and bought the Sunshine decoder lens. It is really cool the way it works – it turns the circle on the back into a sort-of hologram. when you twist the coin under the lens it makes cool designs until in the right place the “VALID” pops out. I think I am going to stick with these because if I ever need to barter, there will be no doubt that these are not counterfeit. Also, the price for these on Silver.com is awesome. Great investment. I love these and each one comes still in the sealed bubbles from the mint. You know it has not been changed. The security feature on the back is nice too. A beautiful 1oz silver bar, fairly priced and I highly recommend SILVER bars to any beginning investor. 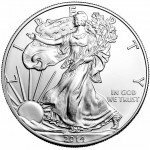 Save silver for yourself or for family, always a great investment and easy to save.